Legal amendments, the continuation of fiscal consolidation and stronger reforms to attract investment and boost exports are needed to underpin a recovery of about 5% to 5.5% growth in 2018, the Central Bank said yesterday, as it prepares to tackle Rs. 1.9 trillion in debt repayments this year. 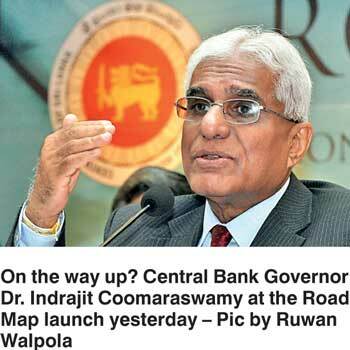 Central Bank Governor Dr. Indrajit Coomaraswamy, presenting the annual Road Map for 2018, exhaustively recapped 2017 and reiterated that growth would likely be a “shade under 4%” for last year. Comparing Sri Lanka to a recovering alcoholic who had to go “cold turkey” before beginning its recovery, the Governor insisted the economy was stabilising but needed the Government to sustain its reforms process and attract investment, warning of severe consequences if growth was artificially pumped with stimulus. Eyeing a recovery in 2018, Sri Lanka is likely to be helped by a stronger global economy, better weather, continuation of economic reforms and greater investment. However, the Central Bank would be cautious of easing monetary policy, officials said, though official interest rates stand at four-year highs but are expected to ease in the new year. “We need to exploit opportunities created by the revival of global growth supported by synchronised economic expansion in Europe, Japan and the US for the first time since the global financial crisis. Better prospects in Europe and the US, which are our two largest markets, are clearly tailwinds. This is growth positive for Sri Lanka. However, we should also be mindful that gradual normalisation of monetary policies in advanced countries could pose some challenges to the economy on both the external and fiscal fronts,” Dr. Coomaraswamy said. The Rs. 1.9 trillion in debt repayments includes about Rs. 600 million in interest rates for International Sovereign Bonds, about $ 2.5 billion in external payments and Rs. 380 billion in local payments. The Central Bank has already indicated its intention to go to the market early this year but has not specified the amount it wishes to raise. Cabinet this week gave approval for the Central Bank to raise up to $ 2 billion from international markets and $ 3 billion from development bonds for debt management and the effort is likely to be aided by the Government’s pending Liability Management Act. The Governor expressed confidence the Act could be signed by the Attorney General as early as this week, after which it would be ready to be tabled in Parliament. The Governor noted the debt situation was “manageable” but emphasised it would only remain so if reforms continued. Dr. Coomaraswamy also outlined ambitious plans to make sweeping legal overhauls of key legislation including the Banking Act, Fiscal Management Responsibility Act and the Monetary Law Act to increase the Central Bank’s independence and assist it to keep monetary policy from being dominated by fiscal policy. “The current framework is hampered by the focus on non-core activities, monetary financing and inadequate autonomy. These factors are structural impediments in the transition path towards Flexible Inflation Targeting (FIT). Amending the Monetary Law Act (MLA) is therefore imperative to enhance the focus of the mandate as well as Central Bank autonomy, governance, transparency and accountability. These amendments would broadly include strengthening the mandate of price stability, separating the monetary and fiscal functions, strengthening the Central Bank’s autonomy, and introducing institutional arrangements for setting inflation targets and maintaining accountability,” he said. The Central Bank is working towards implementing a FIT framework by 2020 to conduct monetary policy in a proactive and forward-looking manner. It has also adopted a more flexible exchange rate policy that promotes export competitiveness. The Government is also committed to a revenue-based fiscal consolidation program, which intends to bring down budget deficits and debt levels progressively. “If we get fiscal policy and monetary policy right, then the pressure on the exchange rate would reduce,” he told reporters. On the monetary policy framework, the Central Bank’s move towards introducing a FIT regime aims to maintain a low inflation environment on a sustained basis. The FIT framework is a data-driven, forward-looking and proactive monetary policy regime built upon three main pillars: strong fiscal policy support, effective monetary policy conduct and strong central bank mandate and credibility. Despite higher than expected headline inflation this year, the Central Bank is confident of numbers easing to mid-single digits in 2018. The Government expects to strengthen fiscal consolidation by revising the Fiscal Management (Responsibility) Act to include binding fiscal targets. This would institutionalise its commitment to fiscal discipline, which is essential given the country’s external debt dynamics and exposure to rating agencies and international capital markets. “We have seen an increased inflow of Foreign Direct Investment (FDI) in 2017 and we expect FDI to gain momentum through the commencement of the Hambantota industrial zone and the continuation of the Colombo Port City project,” he said. Sri Lanka’s banking sector remained in good nick, accounting for over Rs. 10 trillion in assets, while the non-bank financial institutions sector accounts for over Rs. 1 trillion in assets. The implementation of Basel III capital standards commenced in 2017 in order to develop a more robust banking sector, the Governor said, pledging to be tougher on consolidating smaller finance companies. He noted that of the 50 finance companies currently in operation, five had been earmarked as “distressed” and plans for dealing with them have already been approved by the Monetary Board.